picture taken 2 months ago. Hey there, Suzette. It is so good to hear from you all the way over from Beau Bassin, Mauritius, Indian Ocean. Wow! And I would like to take a moment to thank you so much for taking the time to come here and sharing your German Shepherd Dog stories with us all here today. And I absolutely love the picture - it is so lovely. 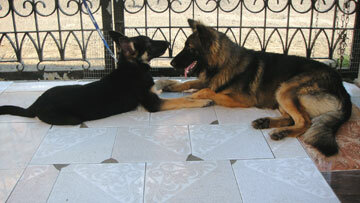 Your German Shepherd Dogs are absolutely beautiful. And they look so comfortable just hanging out there together! I'm not sure exactly what they were doing before the photo was taken - maybe they were playing keep away, wrestling, chasing each other, swimming or whatever but it looks as though right now (in the photo that you sent) that they are discussing what they plan to do next, right after rest time is over. And readers - have a couple of minutes? Let us know what you think about Pixou and Taxi's story by leaving them some comments below. It's pretty easy to do - just click on the link you see below that says "Click here to post comments" and then tell us what you think.